How? Not asking about noise or cast. It can affect accuracy, only in that an arrow may tune better from a particular brace height on a particular bow. Raising brace brings the arrow tip closer to center at brace, and at the moment it leaves the string. Lowering does the opposite. So within tight perameters, a softer spine will favor the lower brace, while the stiffer, the higher brace. Aside from fine tuning an arrow's flight, I know of no other effect brace height would have on accuracy. Agree with wood. If it's too low, a lot too low, the arrow will likely bounce off the shelf at release. That wreaks havoc with accuracy. Too high, doesn't affect accuracy enough to matter. By accuracy, I'm just talking the effects of brace height on good arrow flight. In the end, accuracy rests with the skill of the shooter. Basically what changing brace height does is detune the arrow if the bow and arrow were tuned to begin with. With a lower brace height, the arrow stays on the string longer. So, any movement of the bow after you drop the string will effect the arrow. A lower brace height will have more arrow speed and a longer power stroke. A lower brace height will require a stiff we arrow, not a weaker arrow. I shoot as low a brace height as I can, usually around 7 3/8" to 7 1/2". I'm shooting right handed and my arrows are flying great straight as an arrow but a little to the left 2"-4" every time. I raise my brace height up a few twist in life my arrow starts hitting where I'm looking....center. That's how BH affects my accuracy. And it works going from right to left by lowering BH. The lower brace is less forgiving of bow arm mistakes because the arrow is on the string longer thus more time for bad things to happen. So... After woodshavins’ post, what seems to me to be a logical follow-up question: Does changing the brace height affect tuning MORE as the the side- plate moves farther away from center? There's really no difference GF. Moving the arrow to or from center is moving the arrow to or from center. The only difference in spine tolerance between a straight handled selfbow and a past center target bow is how wide the range of spines is that will work. A past center bow (typically) will shoot arrows 10 or more pounds stiffer than the drawn weight, all the way to 15 or more lbs. softer than the drawn weight. With a straight sided selfbow, you can shoot the softer spines in the same range, but not the stiffer. That is unless you start using arrow length, and point weight to change dynamic spine. I can give one simple example, I was setting up some Acme cedars with 190 grain Ribtecs. When i test shot them, I heard a definite click on my 'sunset' dual shooter, about 3/8" outside of center longbow. I gave the string a few twists and change the brace height a little less than an 1/8". That helped, but with a softer release, that tends to happen when shooting a broadhead arrow at a small deer target with a garage as a back stop, I heard the click again. My arrow nocks were not tight, so I gave the string a few more turns which gave me a total of 3/16" brace height change, that fixed it and the arrow flew perfect with both a hard release and the occasional softer release. Byron Fergusson talked of setting up a hunting rig with consideration for the softer release or shortened draw. It happens to him, me and probably everyone at times. I am prone to an extra hard release on game when shooting right handed and a bit soft on game from some shooting positions shooting left handed. Keeping the brace height a little more than less can assure predictable arrow flight if your arrows are on the verge of being too stiff. I have not found that a taller brace affects lower spined arrows all that much with my longbows. However, some longbows have a much slower cast if you get carried away with too high of a brace height. Thought lower brace height=softer spine? What GLF said as to forgiveness and arrow being on string longer with low brace height . 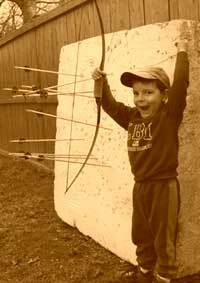 A lower brace height will require a stiff we arrow, not a weaker arrow. I shoot as low a brace height as I can, usually around 7 3/8" to 7 1/2". AS above??? The closer the string is to your bow hand?...the greater "the angle of error" will be. Ideally the string will stay centered unto the bow at the shot finish and not roll inboard (towards your bow arm) nor outboard (away from your bow arm) but since "Absolute Perfection" is a rare event with any given shot finish?...to some small degree the string will finish either slightly inboard or outboard of true center and the lower the BH?...the more amplified "The Angle of Departure" will be making the bow..."Slightly Less Forgiving"...shot too shot. A similar anomaly plays out when a bows riser is "Cut Before Center" and the savvy archer discovers just how critical adjusting brace height is when attempting to hit proper tune as the BH is what sets the arrows angle of departure from the bow. Lowering The BH: Will cause the arrows dynamic spine to stiffen and move impact left. Raising The BH: Will cause the arrows dynamic spine to weaken and move impact right.